CARMEL VALLEY — Meet Mike Haynes: pro football Hall of Famer, former NFL cornerback who played for the New England Patriots and the Los Angeles Raiders, and prostate cancer survivor. The Carmel Valley resident, now 64, has had a lot of successes in the world of sports but perhaps one of his greatest achievements has been to beat prostate cancer. In 2008, at the age of 55, Haynes attended a health screening at the Pro Football Hall of Fame which led him to the discovery he had prostate cancer. Shortly after, he had a real wake-up call. Even though as an athlete he got a physical checkup every year, this one was different. Talking about his story for National Men’s Health Month in June, Haynes wants to help other men be proactive about their health. When he called his primary care physician he was told his number had gone from 3.0 to 3.5 in just three months. “We never had a conversation about it and I quickly learned that my numbers and had gone up, but I was told it wasn’t much of a spike, and I had nothing to really worry about,” said Haynes, who was elected to the Pro Football Hall of Fame in 1997. But instead of turning his head, Haynes pursued the results further and went to a urologist, who told him he might want to think about having a biopsy since his PSA numbers had gone up quite a bit in three years. He followed the advice and had the biopsy done; sure enough, it came back that he had tested positive for a low stage of prostate cancer. Haynes was living in New York at the time and decided he wanted to have surgery to remove the cancer, but he wanted to return to California to be with family. That’s when he called Urology Care Foundation and asked them what he should do, and he looked at their website for treatments and options. Haynes returned to San Diego in 2008 about six months after the diagnosis to have a radical prostatectomy surgery to remove the cancer at UCSD. “It was so innovative; instead of the doctor standing over me doing surgery, a robot did the surgery,” he said. His stay in the hospital was one night and he felt great immediately afterward. Haynes, now in remission for 10 years, ended his career in football in 1990 and has since worked for Callaway Golf as a global licensing manager, as well as an NFL consultant for integrating players after college into careers outside of football. These days he is a consultant and contractor for Key Brands and a number of companies in the health and wellness field. He’s also much more focused on his health and wellness, setting many goals for himself since his cancer. He’s since changed his eating habits, eating less meat, and even his workouts have come of age. “I used to work out with weights, but now I do yoga with my wife,” he laughed. He also likes to walk, hike and play golf. Does he miss football? 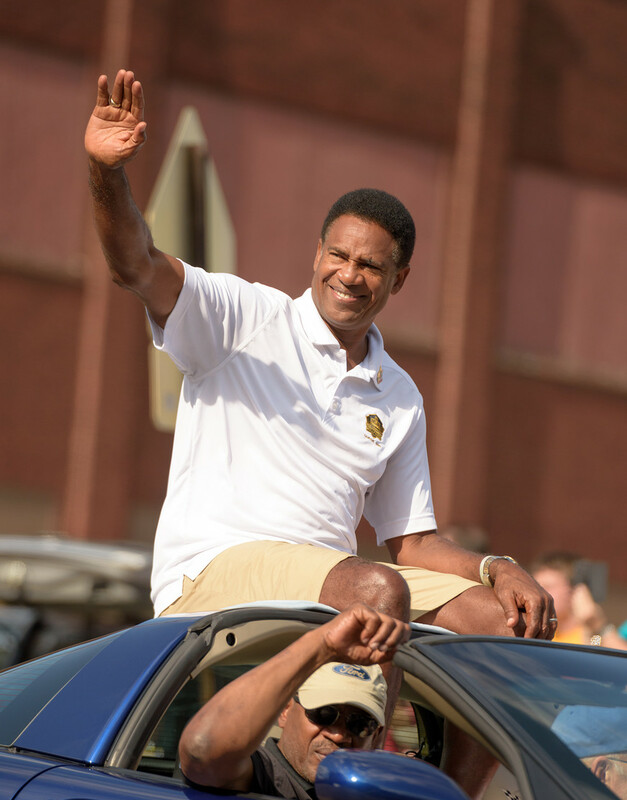 Haynes, a two-time All-American selection at Arizona State University (1972-75) and inducted into the College Football Hall of Fame in 2001 said, not really the game, but more of the camaraderie. His advice to other men who put off health checkups? A spokesman for the Urology Care Foundation at functions, Super Bowls and with the media, he spreads the message to men about watching their health. He is also into philanthropic work including being on the board of the Pro Football Retired Players Association, and San Diego-based Reading Legacies, a group that helps kids learn the importance of reading. As the Urology Care Foundation and the NFL celebrate the 10th anniversary of its partnership, the Know Your Stats campaign encourages men to know their prostate cancer risk and to talk to their doctor about whether prostate cancer screening is right for them. Every 3.2 minutes a man is told he has prostate cancer. 2. Every 18 minutes another man dies of prostate cancer. 3. Prostate cancer affects one in nine men. 4. Prostate cancer affects one in five men who have a family history. 5. Your odds increase to one in six if you are African American. 6. Prostate cancer is the second most common cancer in men. 7. If caught early, it is one of the most treatable forms of cancer. 8. Prostate cancer often doesn’t cause any symptoms until it is a more advanced stage of cancer. 9. There are nearly 3 million prostate cancer survivors in the U.S.
10. If you are age 55 to 69, talk to your doctor about prostate cancer testing.